My God, what memories this brings. 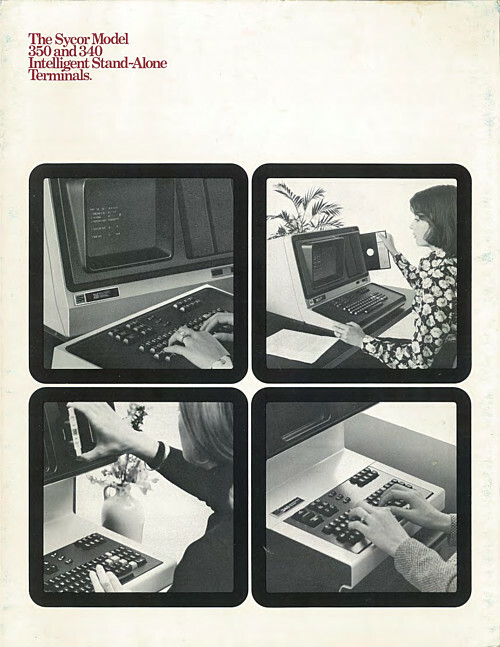 I was the programmer for the Sycor 340 at Providence Washington Insurance in the mid 1970’s. They even had a 3D Tic Tac Toe game you could play. I would make adjustments to the data entry program so the operators could quickly enter policy information. That and some Cobol programming was the bulk of my work in what was my first software job. I tried to decode its assembly language from ascii printouts of some of the programs but was never able to figure out if it was 8008 or 8080 Intel assembly language. There were some great people there – Bill Gardiner and Bill Valcarenghi were my bosses and I worked with Arthur Ironfield, Virginia McElroy and many other great managers and coders. The Marine Corps bought several of these systems in the late ’70s. I was one of several technicians trained to repair the system during 6th month deployments. Our system had the dual cassette decks next to the monitor, dual floppy disks built into the desk, mag tape, and a navy reperf to cut a tape that went to the ships comm center to send the data back to Camp Lejeune. I spent two years (’77-’79) with the 34th Marine Amphibious Unit working on this equipment. Very cool to see this brochure.